IP networks change constantly, automatically re-routing traffic based on network load conditions and when problems occur. While conventional tools poll the infrastructure for health status and utilization metrics, they cannot provide insight into the network's control plane. Without the ability to visualize, monitor, analyze and model changes to the Layer 3 operation of the network, pinpointing and correcting service delivery problems, building in network resiliency, and optimizing performance is ad hoc, manually-intensive and error-prone. Route Explorer™ application, part of Blue Planet Route Optimization and Assurance products, is the industry’s leading IP/MPLS route analytics software, designed for network engineers, architects, planners, peering analysts, and operations teams responsible for today’s complex, mission-critical service provider and enterprise networks. It provides management visibility into routing behavior for all IGP and BGP protocols, Layer 2/3 VPNs, traffic engineering tunnels, segment routing and multicast with real-time monitoring, historical reporting, and what-if modeling capabilities. By passively monitoring the routing protocols that direct the flow of traffic throughout the network, ROA Route Explorer application constructs the routers’ view of the network, computing and displaying topology changes and routes in real time. It provides visibility into the dynamic routing operations across the entire network, enabling fast identification and resolution of difficult-to-diagnose problems, effective and trouble-free maintenance, and the ability to easily and accurately plan for network changes and optimization. Furthermore, it is the foundation for the industry's first independent closed-loop automation platform for core IP/MPLS networks. 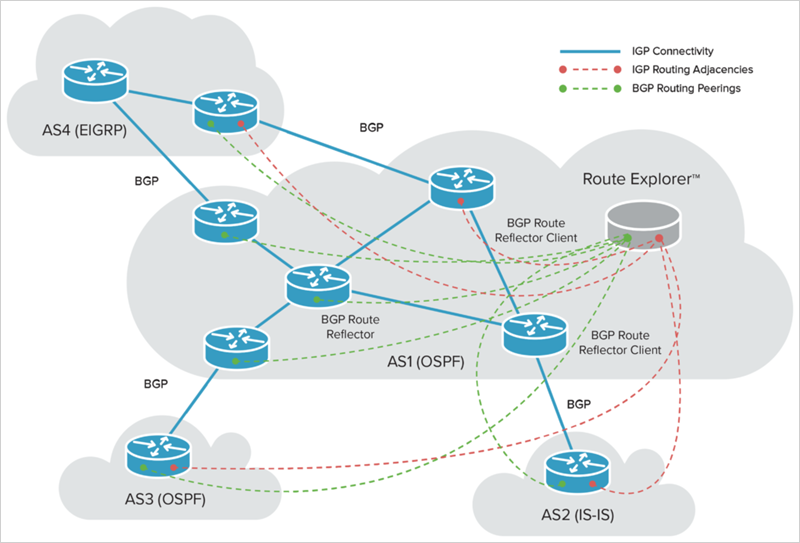 From a single Route Explorer physical or virtual appliance, network professionals can view the real-time routing structure of their entire network as a seamless topology map, even when the network is running multiple protocols, spans multiple domains or Autonomous Systems, or utilizes static routes that are not injected into routing protocols. ROA Route Explorer detects loss of IP-layer connectivity immediately and sends alerts to a management console so that corrective action can be taken. Routing instabilities or changes that go unnoticed by conventional management systems but which impact service availability and performance are visible within seconds, leading to early detection and prevention of service outages, and rapid time-to-repair. Operations dashboards provide network-wide views into service delivery with intuitive drill-in workflows for diagnosing network hot spots or anomalies. Route Explorer supports all of the popular routing protocols and scales to the largest networks with thousands of routers and multiple copies of the Internet routing table. ROA Route Explorer provides a range of alerts that can be enabled selectively, allowing for monitoring of specific routing events or problem areas, and early notification of anomalies or potential failures based on deviations from adaptive baselines. Alert notifications can be viewed on the Route Explorer console, sent to an SNMP-based network management system, or recorded to Syslog for consolidated problem reporting and management. Engineers can quickly trace the precise path that service traffic is following through the network map and see if the traffic is experiencing routing instabilities or outages. Even if routing issues aren’t a direct root cause, path tracing helps engineers to more effectively localize the relevant part of the network for further analysis with other tools such as log analyzers and application performance monitors. The results are faster troubleshooting and lower Mean Time To Resolve (MTTR). Many network operators admit that a high percentage of trouble tickets are closed with no resolution because it was impossible to recreate the problem. Engineers and operations staff also know that even a relatively low percentage of intermittent network problems have the biggest impact on overall MTTR, and these problems drive up opex and hurt customer satisfaction. ROA Route Explorer provides a unique, network-wide history of all routing changes that helps engineers and operators get to the bottom of these costly problems quickly. By “rewinding and replaying” all routing events at any point in time, engineers can see exactly how the network behaved, enabling problems to be quickly identified and diagnosed. Route Explorer’s advanced event filtering capabilities allow rapid isolation of the root cause to a single router or network address. A high percentage of network outages are caused by misconfigurations. Route Explorer enables engineers to model network changes before they’re implemented, preventing outages from simple misconfigurations and even from network architecture errors that only become apparent when routing is altered. Engineers can model a broad range of changes, such as adding or failing routers, interfaces and peerings; adding or moving prefixes; and adjusting IGP metrics or BGP configurations. Critical initiatives, such as data center migrations/consolidations, disaster recovery planning, change validation testing, or failure impact and redundancy analysis, can be easily and accurately performed. Since Route Explorer automatically updates the network topology map through continuous routing protocol recording, there is no work needed to maintain or update the model—it is always current—making interactive modeling easy and fast enough to use on an everyday basis. Custom reports can be generated for any time period, providing an overall understanding of network performance while allowing quick isolation of potential problem areas. In many instances, network problems can be averted and resolved due to early awareness of anomalies. Data from reports can be useful in network maintenance and planning to understand trends, plan for network changes and growth, and verify changes made during scheduled maintenance. In addition, Route Explorer offers detailed diagnostic tools to drill down into specific routing conditions and determine root causes.